Researchers have developed one of the first complete systems to store digital data in DNA -- allowing companies to store data that today would fill a big box store super-center in a space the size of a sugar cube. 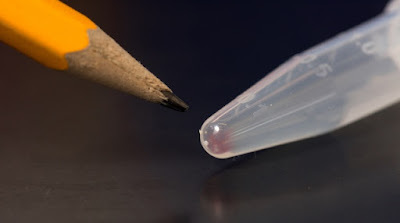 All the movies, images, emails and other digital data from more than 600 basic smartphones (10,000 gigabytes) can be stored in the faint pink smear of DNA at the end of this test tube. But a new technique developed by University of Washington and Microsoft researchers could shrink the space needed to store digital data that today would fill a Walmart super-center down to the size of a sugar cube. More significantly, they were also able to reverse that process -- retrieving the correct sequences from a larger pool of DNA and reconstructing the images without losing a single byte of information. The team has also encoded and retrieved data that authenticates archival video files from the UW's Voices from the Rwanda Tribunal project that contain interviews with judges, lawyers and other personnel from the Rwandan war crime tribunal. "Life has produced this fantastic molecule called DNA that efficiently stores all kinds of information about your genes and how a living system works -- it's very, very compact and very durable," said co-author Luis Ceze, UW associate professor of computer science and engineering. "We're essentially re-purposing it to store digital data -- pictures, videos, documents -- in a manageable way for hundreds or thousands of years." The digital universe -- all the data contained in our computer files, historic archives, movies, photo collections and the exploding volume of digital information collected by businesses and devices worldwide -- is expected to hit 44 trillion gigabytes by 2020. That's a tenfold increase compared to 2013, and will represent enough data to fill more than six stacks of computer tablets stretching to the moon. While not all of that information needs to be saved, the world is producing data faster than the capacity to store it. DNA molecules can store information many millions of times more densely than existing technologies for digital storage -- flash drives, hard drives, magnetic and optical media. Those systems also degrade after a few years or decades, while DNA can reliably preserve information for centuries. DNA is best suited for archival applications, rather than instances where files need to be accessed immediately. The team from the Molecular Information Systems Lab housed in the UW Electrical Engineering Building, in close collaboration with Microsoft Research, is developing a DNA-based storage system that it expects could address the world's needs for archival storage. First, the researchers developed a novel approach to convert the long strings of ones and zeroes in digital data into the four basic building blocks of DNA sequences -- adenine, guanine, cytosine and thymine. "How you go from ones and zeroes to As, Gs, Cs and Ts really matters because if you use a smart approach, you can make it very dense and you don't get a lot of errors," said co-author Georg Seelig, a UW associate professor of electrical engineering and of computer science and engineering. "If you do it wrong, you get a lot of mistakes." The UW and Microsoft researchers are one of two teams nationwide that have also demonstrated the ability to perform "random access" -- to identify and retrieve the correct sequences from this large pool of random DNA molecules, which is a task similar to reassembling one chapter of a story from a library of torn books. To access the stored data later, the researchers also encode the equivalent of zip codes and street addresses into the DNA sequences. Using Polymerase Chain Reaction (PCR) techniques -- commonly used in molecular biology -- helps them more easily identify the zip codes they are looking for. Using DNA sequencing techniques, the researchers can then "read" the data and convert them back to a video, image or document file by using the street addresses to reorder the data. Currently, the largest barrier to viable DNA storage is the cost and efficiency with which DNA can be synthesized (or manufactured) and sequenced (or read) on a large scale. But researchers say there's no technical barrier to achieving those gains if the right incentives are in place. Advances in DNA storage rely on techniques pioneered by the biotechnology industry, but also incorporate new expertise. The team's encoding approach, for instance, borrows from error correction schemes commonly used in computer memory -- which hadn't been applied to DNA. "This is an example where we're borrowing something from nature -- DNA -- to store information. But we're using something we know from computers -- how to correct memory errors -- and applying that back to nature," said Ceze. "This multidisciplinary approach is what makes this project exciting. We are drawing from a diverse set of disciplines to push the boundaries of what can be done with DNA. And, as a result, creating a storage system with unprecedented density and durability," said Karin Strauss, a researcher at Microsoft and UW affiliate associate professor of computer science and engineering. Co-authors include UW computer science and engineering doctoral student James Bornholt, UW bio-engineering doctoral student Randolph Lopez and Douglas Carmean, a partner architect at Microsoft Research and a UW affiliate professor of computer science and engineering. The above post is reprinted from materials provided by University of Washington. The original item was written by Jennifer Langston.